People are talking, and we don’t mind. Whether you’ve played Bingo before or not, we’ll ignite your passion for the game. Wink Bingo is more than just a Bingo site. It’s a way to let go! The Wink community is made up of people of all ages and backgrounds. What binds them together is their love of Bingo and love of laughs. 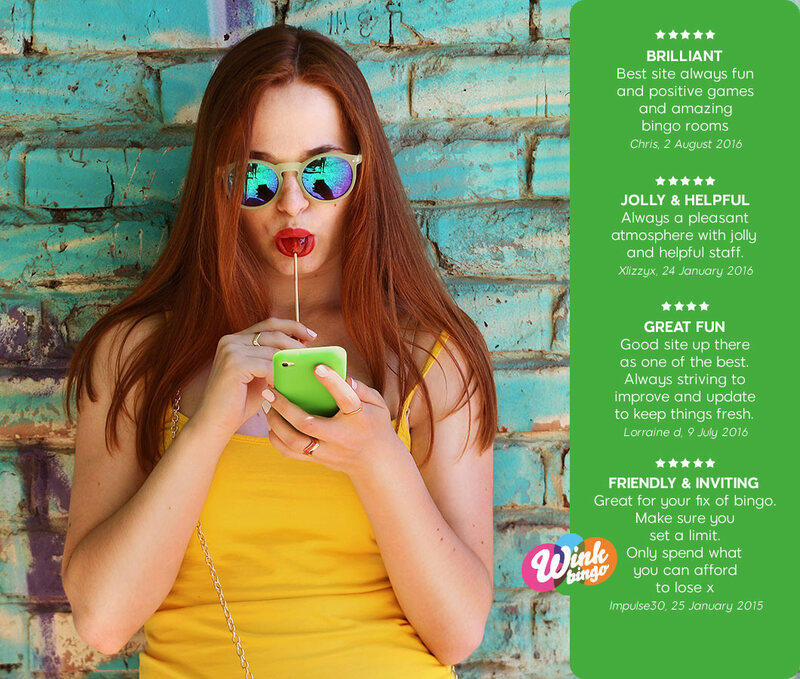 Wink Bingo facilitates this fun environment by providing you with the most technologically advanced Bingo platform, which also happens to be super user-friendly. Here at Wink, we’re always striving to get one up on ourselves. That’s why we love to hear from our players and community members. We take your feedback seriously. That’s why we use the Trust Pilot system to collect reviews from our players. Trust Pilot is an intelligent review software that ensures we don’t interfere with what you have to say. All your reviews go directly onto our website via Trust Pilot. We are not allowed to screen your feedback or withhold information. Whatever you have to say about us is out there for all to see. We encourage our players to post honest reviews and let us know where we can improve. Don’t take our word for it! Websites that use Trust Pilot can invite their customers to write a review. When a review comes from an actual customer (or player in our case) it is considered to be “Verified”. You might be accustomed to seeing the words “Verified Customer” in big online shopping websites. At Wink Bingo, it’s exactly the same. In our case, Verified Reviews are written by players who have actually registered and deposited with us. This gives you the chance to make an informed choice based on real and honest reactions from Wink Bingo players. I have had no teething troubles with this site its bright clear easy to navigate and the bingo is fun and I participate frequently. However fun is fun and gambling is not a good career move, so don't expect to get rich overnight but do expect to have fun. Easy to use and understand, good prize money and good customer services. Always a pleasant atmosphere with jolly and helpful staff. Good site up there as one of the best. Always striving to improve and update to keep things fresh. I love Wink! Have been a member for a few years and have had some great wins! I have my favourite games but I do know when to stop! Great for your fix of bingo. Make sure you set a limit. Only spend what you can afford to lose x.
WinkBingo paid for my tuition! I had my doubts about winkbingo at first, like other bingo sites on the internet are sites to con innocent individuals, however, I was pleasantly surprised with the Winkbingo service, I've been using their service for a few months and got lucky and won big! It's worth checking out if you haven't already! We strive to make fun, even more fun. As well as improving our product, we’re constantly looking for ways to make your online gaming environment safe and secure. By collecting trusted reviews and feedback from fellow players, you get to hear opinions, plus we learn where we can do better. Trust Pilot enables us to build trust in a transparent way, in the hope that you’ll be able to relax EVEN more so that you can sit back and enjoy your game!